Lucky NUgget Casino Review - Get a NZ$1000 Welcome Bonus Today! Lucky Nugget Welcomes players from New Zealand Lucky Nugget Casino is one of the long running gaming websites in New Zealand that has gotten better with time, mostly thanks to the new and improved games added by Microgaming to the ever-growing platform. The casino is more of a diamond in the ruff than a golden nugget. While it was established back in 1998, it uses the latest in Microgaming casino software but the website continues to keep that classic style that can take players back to the old days of online gaming. Don’t let this fool you however since the only thing needed is a quick registration and things change drastically after logging in. The lobby keeps the layout of the new instant play casinos from the developer while also offering the option to download the casino onto a computer. Getting past the website and we see that the operator is a trusted member of The Palace Group, thus having access to the renowned loyalty program and various promotions every month. Customers who join from New Zealand will get a dedicated version of the website that caters directly to them by offering NZD as the default currency, as well as other details. Lucky Nugget Casino has been licensed by the Malta Gaming Authority and verified by eCOGRA for fair games. Claim your bonus of up to NZ$1,000 at Lucky Nugget! Rather than looking for information on the Lucky Nugget Casino website, you are much better off reading the online review and registering directly if you like what you see. The button to start the sign up process is on the top banner and will open a secure window. There are three steps needed to create an account. You will have to choose a username, password and an email, before moving on to the step for personal details. 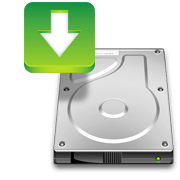 Downloading is also very easy as you just need to scroll down to find the large button for getting the casino app for Windows PC. The small .exe file can be started with a double click and it will install the casino rather quickly. Smart installation allows you to have access to Lucky Nugget games while some are still being downloaded and installed in the background. If you want to skip the downloading step, just login on the site and enjoy the instant premium casino. One of the reasons that the site could use an update is that it provides dated information about the gaming options. Although Lucky Nugget claims to have around 300 games, the actual number is above 600 by download and about 450 by playing instantly from the browser. This makes for quite the collection of games where pokies represent the main attraction given the very impressive themes brought to life by HD graphics. There are also plenty of alternatives that deserve our attention. Slots: Microgaming is definitely a fan favourite when it comes to slots developers in New Zealand. Not only does it have a portfolio of hot games but it doesn’t seem to be slowing down when it comes to creating new games. Some recommended options here are Emperor of the Sea, Dragon's Myth, So Much Candy and Pretty Kitty. Blackjack: There isn’t a card game that gets as much love as blackjack in casinos and Lucky Nugget has an impressive collection of versions waiting for eager players. Spanish Blackjack can provide a slightly different set of rules than the standard games and so can Hi Lo 13 European Blackjack. Roulette: In a land-based casino, the roulette tables always seem to attract lucky players and this is not that much different when playing online. You will have more than half a dozen roulette games to choose from at Lucky Nugget Casino, including American, European and French. Video Poker: It wouldn’t be a full casino without options for video poker and we actually found 24 different games in the category on the site. Each comes with something a bit different but the classics are still there, like Tens or Better and All American Poker. Live Dealer Games: The live casino has some of the best looking live dealer games on the internet. New Zealanders will find tables exclusive to The Palace Group as well as the best options from Evolution Gaming. Live Blackjack can really bring that casino experience to the screen. Despite the fact that there is no mention of mobile on the website, players will get a good selection if they want to use either a smartphone or a tablet to connect. 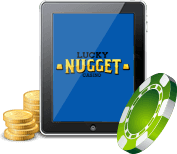 The Lucky Nugget Casino review found the website to run very smoothly on mobile devices after being signed in and the lobby displays about 130 mobile options. 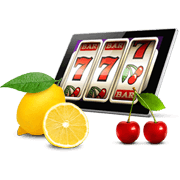 Since pretty much every smartphone model nowadays has the capability to run sites based in Flash or HTML5, Lucky Nugget Mobile Casino is compatible with Samsung Galaxy, iPhone, BlackBerry and other smartphones that fall in the same range. No download is required for playing on the web browser apps on the phones. We also did a quick search on iTunes and found the Lucky Nugget Casino app. As you could expect, this is exclusive for iPhone, iPad or iPod touch and requires iOS 8 or later. The best graphics can best be seen on the latest models since the bigger and sharper screens make playing mobile pokies very entertaining. Given the fact that many different players frequent Lucky Nugget Casino, the first deposit will come with a choice between two welcome bonuses. The standard one is a bonus of 150% that goes up to $200, while the high roller option is of 100% and can reach $1,000. Something to consider when picking the bonus is that the sum of free money received as a result of the welcome offer will have to be played through 50 times before withdrawing. For meeting the mentioned wagering requirements, players are encouraged to bet on the slots. This is because all of the slots games, along with keno and scratch card games, have 100% contribution rates for the placed bets. Video poker and most blackjack games only contribute 10% and this means that one would have to bet a lot more money to clear the requirement. It may be one of the terms that catches new players by surprise but it is actually very common with online casinos. Also, the 50x rate is standard nowadays for Microgaming-powered sites and it is made very clear in the bonus details. Bets will earn you loyalty points at Lucky Nugget Casino. The actual rate depends on the games but traditional slots and keno are the most generous, offering 3 points for every $10 wagered. Points are a form of free cash since they can be turned into real money and they also establish in what loyalty tier each player is located. As a result, more points doesn’t just mean more money directly from the exchange but also more rewards and benefits from the higher tier. Support is pretty good and players don’t have to be registered to use it. For visitors on the site, the best option is to call the provided phone number that matches the country of residence. New Zealand is of course included here and the toll free line is open 24/7. Instant live chat can also be started on the website but is better for players who use it from the casino lobby. In addition, messages can be sent by email and the replies will appear in the account. Being online for close to two decades is certainly a big plus in the favour of Lucky Nugget Casino and its reliability. Another good sign is the MGA license held by Bayton Ltd, the managing company. Tens of banking options cover the international player base at Lucky Nugget Casino and users from New Zealand will have access to quite a few of the frequently used methods. Web wallets like EcoPayz, NETELLER and Skrill are joined by InstaDebit, EntroPay and the classic cards from Visa and MasterCard. Deposits are done securely on the online casino and the money will become available in the account balance immediately, to make sure that users don’t waste any time when they want to start playing. Withdrawals are not as quick and it will take at least 24 hours to get the money out. In fact, most options have a timeframe of 2-6 days so it is good to take this into account when planning out a withdrawal of funds from Lucky Nugget. Payments can also be sped up for customers who reach VIP status. Lucky Nugget Casino might not be great at making a good first impression but this shouldn’t discourage users from giving it a chance. As seen in the online casino review, the software and the lobby are modern and this means access to the best and latest gaming creations that Microgaming has to offer. The instant version is great and having the download option close by is a nice touch as well, not to mention that the mobile casino is perfect for a few rounds of betting throughout the day. Casual players will benefit from the 150% bonus up to $200 while high rollers can get up to $1,000 for free on the first deposit. Plenty of other promotions will be shown once a registered member of the casino and you can make the needed financial transactions knowing that everything is secure, licensed, regulated and fair. In conclusion, Lucky Nugget Casino didn’t get millions of active players for no reason and you can join the community today.